Plate from Richard Bridgens' 'West India Scenery.' It depicts an enslaved man working in the fields on a sugar plantation in the early 19th century. 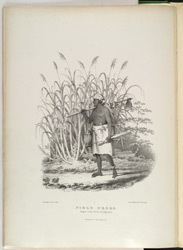 He is pictured carrying a hoe, which would have been used to prepare holes for the planting of the sugar canes. He also has a cutlass and crook, which were used for removing dead leaves from the canes. He carries a pair of sandals on the end of the hoe and around his arm is a 'too too' or 'tie tie,' a coarse scarf.